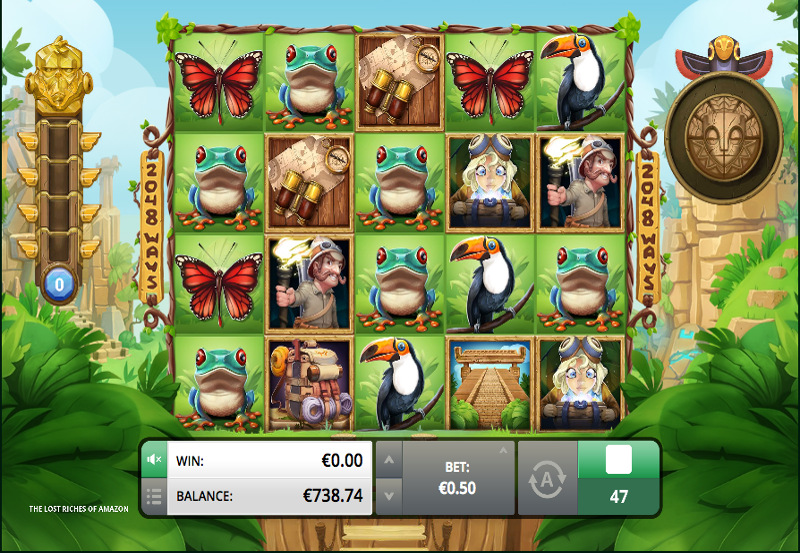 Here's one of the superb new online slots from Foxium that you must try. Ah the Amazon. Exotic, beautiful, mysterious. Who knows what treasures lie buried within the most impenetrable parts of this wilderness. Well wonder no longer, because with the help of Foxium you are about to find out! Everything about this slot in innovative. There are none of your bog-standard playing card symbols to fill up the icons – every symbol is themed ensuring the most immersive experience possible. Keep your eyes peeled for varied wildlife such as a lazy sloth, big-eyed frog, and fluttering butterfly. You might even bump into some fellow explorers! The symbols are set against an idyllic and exotic backdrop dotted with totem poles and luscious green foliage, which offer welcome shade from the cloudless sky. Foxium are relative newbies to the gaming world, only being created in 2015! However they have risen to the challenge of standing out in this competitive industry by creating stellar games which show considerable innovation and ambition. This lively spirit is evident in the unusual features present in The Lost Riches of Amazon, such as the Wheel of Fortune bonus round and 4x5 layout. If all this trekking through the undergrowth has made you hungry, have a go at Foxium’s Lucky Bakery game. If you love promo's, get the best recent slot offers today. This is bigger than most slots as you play across a massive 4x5 grid. The minimum bet is a mere 0.50 whilst the maximum is a sizeable 125.00. This ensures that all types of players can enjoy the beauty of this slot. Though you’ll surely be in awe of everything you see around you, make sure you keep an eye out for golden monkey heads. Collecting 10 of these as you play will open up a secret passageway through the undergrowth and lead you to an exciting bonus round! The bonus game you are taken to depends on how many of the monkey heads you were able to collect, and they range from a simple mini-game to a more dramatic wheel of fortune round! 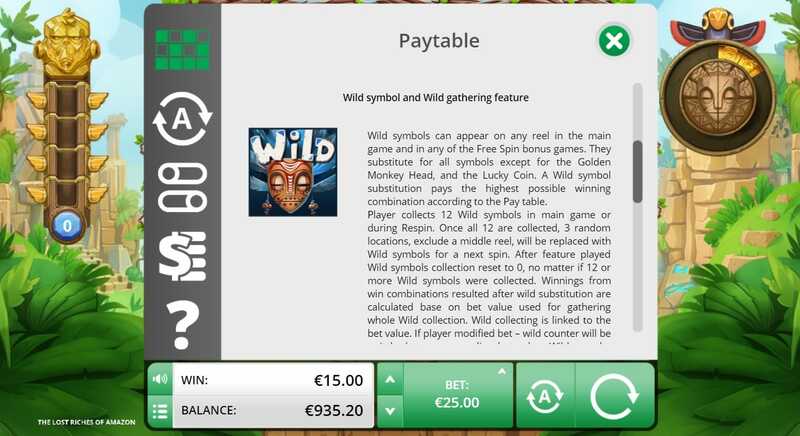 Unlike most slots, the Wilds in this game have been spiced up to make things more interesting! Rather than the usual substitution role, in this game, they offer you a lot more fun. You have to collect 12 of them at which point they will become fixed along the entire middle reel and at 3 other random points on the board. Though the initial trek to locate the 12 might seem arduous, once they’ve been found the wins should come flooding in! Foxium has done an amazing job over every inch of this game. It is packed full of innovative features which make this stand out from other slots, such as the 4x5 size, many fun bonus rounds, collecting Wilds system, and completely themed symbols. A high level of volatility makes this game a challenge but the rewards are sweet and the graphics are stellar so you’re unlikely to mind if it takes you a while to rake in the wins!